140 mm/50 3rd Year Type16 х 1 pcs. Ashitaka — Japanese premium Tier VII battleship. Ashitaka would have been the fourth battlecruiser of the Amagi-class. She was laid down in 1921 but was never completed; instead, she was cancelled and broken up for scrap in 1924. When launched, Ashitaka would have boasted a very high speed and carried ten 410 mm guns. Ashitaka was first released for sale worldwide on 1 December 2017. Veteran captains who worked through Amagi's old Hull (A) before it was removed will have a good idea of what to look forward to when captaining Ashitaka. She follows the same trend as Mutsu, where a ship's original stock hull is removed and presented as a premium one tier lower. Ostensibly, this is what Ashitaka is: a slightly worse Amagi which has been brought down to Tier VII. Ashitaka has ten 410mm guns mounted in five turrets, in the exact same arrangement as her sister ship, Amagi. However, this is about where the similarities between the two end, and the Ashitaka becomes more comparable to the other Tier VII Japanese battleship, Nagato. Similar to all other battleships from Tiers VI and VII, Ashitaka has 25mm of bow armor plating protection, leaving her vulnerable to overmatch by many battleships at her matchmaking spread. Her main guns represent those of the T8 Japanese Battleship Amagi, firing the same shells however at a slightly longer reload. This makes Ashitaka‘s broadside one of the most devastating broadside of any T7 Battleship, losing only to the French Lyon which however has a smaller caliber and worse accuracy. Ashitaka also has the same accuracy as her sister ship Amagi, with identical dispersion and sigma values. She even has the same range, but unfortunately loses the ability to mount a Spotting Aircraft ( ). She also has an armor belt extending from just in front of her first gun all the way back to near her aft. While it only covers half of Ashitaka's broadside, this is enough to bounce a good number of shells while angled. Anyone who enjoys Amagi will likely feel at home with Ashitaka’s play style. Angling into or away from enemies will cause her to become much more survivable, and her guns are good enough. Just watch for cruisers, as HE typically deals a significant amount of damage to her. Also, be very wary of aircraft carriers; Ashitaka doesn't have enough AA to dissuade potential strikes, and her long hull makes for a prime target. Like her sister-ship Amagi, Ashitaka boasts an impressive main battery armament of ten 410mm guns. Long main battery range for her tier at 19.9km. Main guns are accurate and usually have little trouble hitting distant targets. Can outrun most other Tier VII battleships with her 30 knot speed. The ship’s main armor belt extends to cover most of the stern, allowing her to tank more effectively when angled away. Immense broadside firepower; number of shells will frequently guarantee citadel hits against broadside targets. Tier bully. Tier V's will often not realize the fate they will get if they run up on her. Lacks the large torpedo bulge found on Amagi. Main armor belt is thinner than most other Tier VII battleships. Lacks a catapult to launch a Catapult Fighter ( ) or Spotting Aircraft ( ). The ship’s anti-aircraft armament is light, leaving her vulnerable to attacks from enemy aircraft carriers. As a premium ship, Ashitaka doesn't have any upgrades to research. Upgrade Slot 3 allows for specialization in certain roles. Aiming Systems Modification 1 is a generally viable choice which benefits the main and secondary armaments. Players may also choose to equip Secondary Battery Modification 2 ( ) to significantly improve the range and dispersion of the ship's secondary guns. This upgrade is useful for players who wish to maximize damage output in close-range engagements. As a battleship, Ashitaka features high detection ranges that make concealment builds not very effective. Thus, damage mitigation builds are recommended. Fire Prevention is extremely useful for reducing incoming fire damage, as well as other survival skills like High Alert, Vigilance, and Basics of Survivability. Ashitaka does not have strong AA, so captain skills for this are less useful. As a premium ship, Ashitaka comes included with Type 10 camouflage that lowers her detection radius, reduces the accuracy of incoming shells, and increases the amount of experience she earns. The Ashitaka, as a Tier VII premium battleship, has a fairly standard set of signal flags that are recommended. Typical to most battleships, India Delta ( ) and India Yankee ( ) are highly recommended to increase survivability of the ship, while November Foxtrot ( ) and Sierra Mike ( ) are recommended for better versatility. November Echo Setteseven ( ) may also be mounted as well, however that will only boost the meager anti-aircraft armament slightly. As the Ashitaka is a premium ship, the economic and special signal flags can be mounted to further boost the economic and experience gains of the ship. Secondaries open up on an enemy battleship. Tosa after construction was halted in 1922 by the Washington Naval Treaty. The Tosa class was to be the design basis for the Amagi class. The Amagi class (天城型 Amagi-gata?) was a series of four battlecruisers planned for the Imperial Japanese Navy as part of the so-called Eight-eight fleet. The ships were to be named Amagi, Akagi, Atago, and Takao (initially named Ashitaka), after the mountains Amagi, Akagi, Atago, and Takao. The Amagi design was essentially a lengthened version of the Tosa-class battleship, but with a thinner armored belt and deck and a modified secondary battery arrangement. Limitations imposed by the 1922 Washington Naval Treaty prevented the class from being completed as designed. 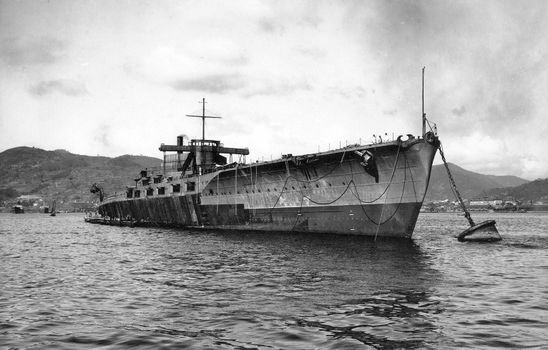 However, the treaty had a limited allowance for hulls already under construction to be converted into aircraft carriers. Amagi and Akagi were both intended for conversion, but an earthquake damaged the hull of Amagi so extensively that the ship was scrapped. Akagi was reconstructed as an aircraft carrier and served with distinction as part of the Kido Butai during the Second World War, participating in the Japanese attack on Pearl Harbor before being sunk at the Battle of Midway. Atago and Ashitaka were both scrapped on the ways and never launched or commissioned. Actual name is Takao. The ship was only named Ashitaka initially. Ashitaka's original 1920s design is not represented. Ashitaka is depicted in-game in a fictitious World War II configuration. Her anti-aircraft armament, for example, actually consisted of only four single 120mm dual-purpose guns. Light and dark green camouflage was only applied to aircraft carriers in 1944. 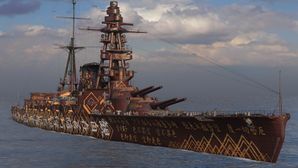 Even though Ashitaka is fictionally modernized, Japanese battleships during World War II were painted in overall dark gray. Tosa after preparations for use as a target hull. Tosa under tow, on her way to be sunk as a target vessel. Design for the Amagi class. This page was last modified on 6 October 2018, at 09:11. This page has been accessed 57,967 times.